I've been a fan of J.J. Abrams ever since Alias. I own all five seasons of that show, and have re-watched my favorite episodes numerous times. While I passed on Lost, I also watched and very much enjoyed Fringe, his latest television series. Overall, I think he's got a lot of talent and possesses a knack for coming up with ideas that fire the imagination of the viewers. That having been said, I think Abrams' greatest strength is also his greatest weakness. He's an "Idea Man", but I feel he lacks the attention to detail and the ability or willingness to follow those ideas through to their logical or possible conclusions. In the same way that a CEO is supposed to be the grand visionary for a company, steering it along a course towards greatness, Abrams is the visionary of his stories, pushing them towards what he believes to be a great finished product. But at the end of the day, I think this kind of storytelling relies heavily on the WOW factor. It's Vegas, baby. You dive in, bathe in the glitz and glamor, become awed by the sensory overload and feel like you're having the time of your life. Then you wake up around three in the afternoon the next day with a raging hangover, carpet mouth, and you're about five grand in the hole. When I watch an Abrams story, I admit to being caught up in the stirring visuals, the powerful score, the drama and excitement. But about an hour after I walk out of the theater, I'm already angry with myself for falling prey to what I feel to be sub-par writing, especially when it comes to building a story that makes sense. I feel like Abrams must walk up to a big white-board and scribble down a handful of "moments" he wants to see happen, and then finds a way, come hell or high water, to make those moments connect with each other over the course of the film, whether those connections make sense or not. I think this holds especially true to the opening sequence of the film, on the planet of Nibiru. Why is the Enterprise, a gigantic space ship, studying a primitive planet by sitting submerged in the ocean? If you want to hide a space ship, how about you hide it in space? Clearly, Abrams had in his mind the vision of the Enterprise rising majestically out of the water as primitive natives look up at it in awe, water pouring off the saucer section in a brilliant cascade while Michael Giacchino's score trumpets all around us. Was the moment impressively stirring? Sure. Did it make any sense? None whatsoever. Even to the point where Abrams had the gall to allow Scotty to rant and rave about how stupid it was to hide a space ship in the ocean. And of course, being in the ocean, in order for them to have to do what they do next, they need to emerge from the water and get seen by the natives, while if they'd just remained in orbit, according to the logic of the film, they'd have been all set. It's these sorts of fragile premises that appear all throughout the film. I wonder if any of Abrams' writers or other coworkers ever question the logic of these scenarios, giving a little pushback or trying to poke holes in the logic? It makes me feel like all writers, but especially those who write fantasy or science fiction stories, should participate in some tabletop role-playing games. As one who's been gaming for going on 20 years now, I can tell you that nothing picks apart your "grand vision" faster than a handful of players who excel at out of the box thinking. If nothing else, you will become much better at defending your own ideas, and building ideas that make sense. If the Chief Engineer of your starship - one of the most senior crew members aboard - can't figure out why you decided to plonk your gigantic space-faring vessel in the ocean, maybe it's a stupid idea for your movie. I wrote my own quasi-review of this movie last night to post later this week. Think I'll update it to link back to yours, if you don't mind. I agree with what you said. I might have enjoyed the movie more than you did, but the more I think about it the less I like it. But when I was sitting in the theater stuffing popcorn in my face, the fun I was having more often than not kept me happy in my seat. On an unrelated note, saw a commercial on TV last night for the DVD release of The Last Stand. Remembered emailing you from my seat at that sucker, heh. Might have to pick that one up -- I probably enjoyed it the most of all the throwback action movies that have come out recently. I've heard it said one of the greatest sins a movie can commit is to remind the viewer of another, better film they could be watching instead. On reflection, STID has several such moments, particularly across the final act. I wonder what this bodes for Abrams' forthcoming treatment of Star Wars. Your comment about an Abrams film being like the aftermath of a drinking bout is a great metaphor. I never watched Alias, Lost, or Fringe and didn't know he was involved with those. I did like both STar Treks quite a bit but there were certainly plenty of logic lapses. The sea going Enterprise was one of those. In fact, I thought it was generally considered impossible for Enterprise class ships to actually land on a planet. Yeah, they specifically show vertical thrusters built into the ship this time around, but I think it was again bandaging a bad idea, rather than just coming up with a better idea. Don't get me wrong, it was entertaining, but ...Vegas. Great review! 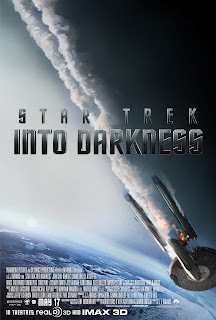 Action packed movie which I enjoyed, but so many illogical sections for older Star Trek fans. Why would Spock have a love interest with Uhuru? Never mentioned before and no sense from Mr Emotionless. Why did they ever mess with one of the best Star Trek movies ever... being Wrath of Khan?? And this movie completely changed the order of events from the original series or the movies. Kirk found Khan's ship floating in space in the original. Also, absolutely silly why they completely turned around the death scene between Kirk and Spock from Wrath of Khan. Star Trek 2009, in my opinion, was a great movie, and was true to many mentions from the original series or previous films. STID may be entertaining, and enjoyable to the younger crowd, but was barely a Star Trek film if you are a devoted follower. I managed to get my hands on a recorded conversation between Abrams and screenwriter Robert Orci regarding the Trek film, and it's rather eye-opening how they went about the creation of the story. Loved your suggestion for screenwriters at the end of the post about the virtues of tabletop rpgs!